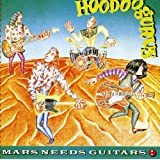 HOODOO GURUS "mars needs guitars!" and theyre still touring and releasing albums after some 30+ years. Solo outing for ex-drummer of The Replacements. Album title is a cheeky dig at former band mates. Turned out to be quite a good album! hate the cover art, love the album,but MH doesnt like it too much.